City council members listen as resident Linda Winter speaks during public comment at Tuesday's meeting. Two hours of public comment didn’t change the outcome of the Wichita City Council’s vote on a deal to sell land around the new baseball stadium for private development. 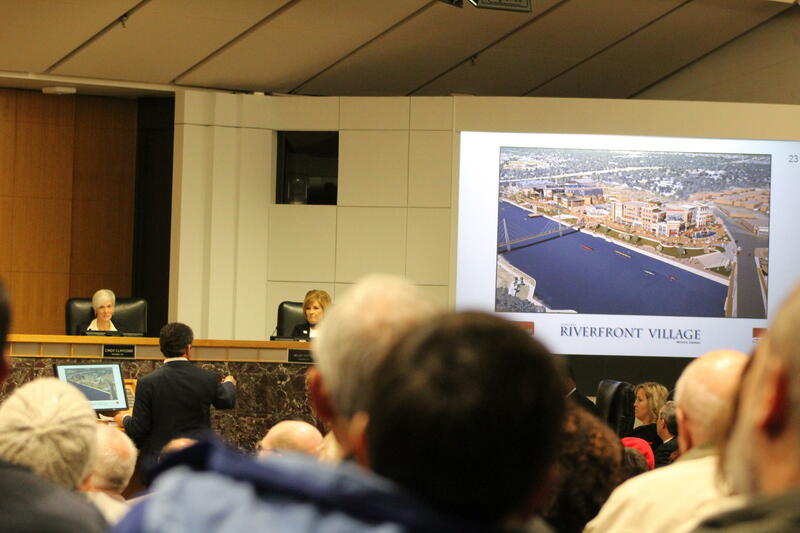 Council members voted unanimously Tuesday night to approve an agreement with Wichita Riverfront LP, a group that includes owners of the baseball team and undisclosed local developers. Under the agreement, the city will sell a little more than 4 acres of land between Maple and Douglas for $1 an acre. The city will also redesign and reconstruct McLean Boulevard into a pedestrian friendly, two-lane street. The vote was held during a rare evening meeting for the council, which normally holds its Tuesday meetings at 9 a.m. The city changed the time to allow more residents to attend in response to public criticism over a lack of transparency surrounding the project; the land agreement was only made public earlier this month. 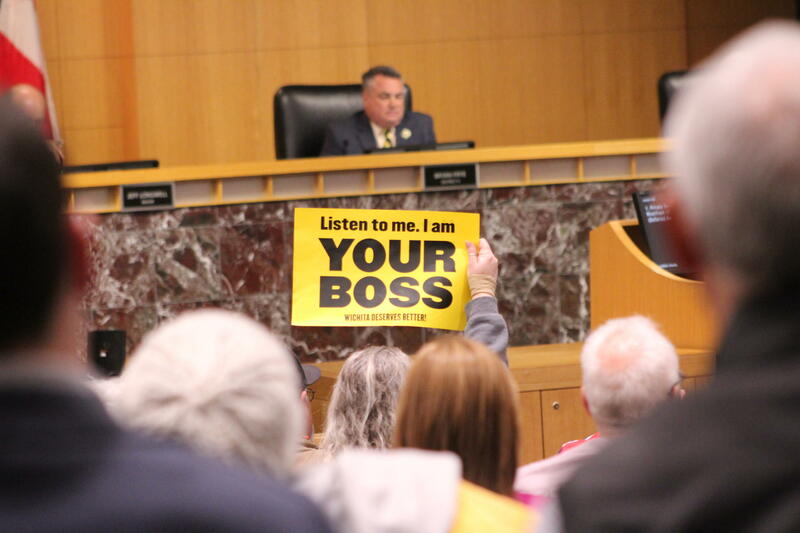 An attendee at Tuesday's council meeting holds up a sign. Development rights for the area around the stadium were one of the team’s requirements to move from New Orleans to Wichita. The city is also offering the group almost 3 acres north of the Drury Hotel on the other side of the river at a cost of $1 million. The agreement with Wichita Riverfront LP was the “third leg of the stool” for the city’s deal to bring affiliated baseball back to Wichita, said Assistant City Manager Scot Rigby. The council already approved a ballpark development agreement and a facilities use management agreement late last year. “The land is virtually an extension of the ballpark," he said. The $77 million stadium project — as well as additional infrastructure and improvement work along the river — is being funded largely by three streams: a Tax Increment Finance, or TIF, district; an added 2 percent sales tax within a Community Improvement District; and STAR bonds, which will capture additional sales tax revenue raised in the area. The city also expects to issue general obligation bonds to pay for the project. A separate development is planned for the area just north of the stadium. Wichita developer George Laham presented to the council his renderings for what he calls "Riverfront Village,” which would feature retail and office space, residences and a boutique hotel. He said like Bradley Fair in east Wichita, the stadium development would progress as needed. He’s planning between 35,000 and 50,000 square feet in the first phase. George Laham presents his concept for the planned Riverfront Village development north of the stadium. “We’re going to build this only as there is demand,” he said. Some residents raised comparisons to the failed WaterWalk project across the river, which also promised to be a destination for entertainment. Jim Garvey, former owner of the Garvey Center in downtown Wichita, questioned whether the new riverfront project would generate enough tax revenue to pay off stadium debt. He estimated rent will be $40 a foot in those spaces, compared to $10 a foot in other shops along Douglas in Delano. “How realistic is it that those are going to pay the STAR bonds and you’re not going to put it on us, the taxpayer?” he said. John Todd, a political activist and retired real estate developer, said his biggest problem with the city “playing real estate developer” is that council members have “no skin in the game." Danielle Saunders said she worked at Lawrence-Dumont Stadium and conceded that it needed to be torn down. But she said the land there is worth more than the city’s $1-an-acre price tag. “My concern with this new plan is that it’s not open to other investors and developers, some of those who have helped us build the city of Wichita,” she said. “Let’s start with just getting baseball here. Let’s hold off on the land contract right now. Council member James Clendenin defended the city’s decision to offer the land to new team. He said the city is giving developers about $800,000 in exchange for millions of dollars in investments. The city projects the TIF, CID and STAR Bonds, plus naming rights, will generate about $38 million over the next 20 years to pay for the stadium. City Manager Robert Layton said the city is still in the process of platting the property included in the development agreement. He did express regret that the city wasn’t more open about the deal earlier. Not all of the public comment was negative; several residents encouraged the project and the pace it’s moving forward. “We need to go ahead with this. This is fabulous,” said Marilyn Bower, a volunteer advocate for the Delano Neighborhood Association. Wichita City Council members will vote later this month on a plan to sell land around the new riverfront baseball stadium to the team’s owners for a dollar an acre. The city currently owns the 24 acres in Delano where the stadium is being constructed, including roughly 4.5 acres that the city wants to transfer to Wichita Riverfront LP to develop as a retail, commercial and hospitality site. The city of Wichita has unveiled new renderings of the future baseball stadium in Delano. Construction crews will have just more than a year to finish the stadium in time for the 2020 baseball season.